June 6, 2013, marks the day one of my fondest dreams will come true. My husband Scott and I will return to Zambia with Noah, an amazing 15-and-a-half-year-old who is like a grandchild to us and the child of our hearts. I have been dreaming of taking Noah to Africa since he was five. Now, not only can we bring Noah on this incredible experience, but he will also be able to actively participate with Pack for a Purpose (PfaP) on our trip, providing supplies and visiting some of the projects supported by the lodgings we are visiting. We’ve all heard the phrase, It takes a village to raise a child. In terms of our trip to Zambia and the supplies we are bringing there, a large community of generous Americans from coast to coast has contributed. Our first stop in Zambia will be at Kafunta, which supports Project Luangwa. This project works to build school infrastructure and increase educational standards by engaging in responsible tourism. For this lodging, we have collected several items that they will take to the project for us. In the winter of 2012, I was contacted and asked if I had a need for high-end, brand new readers of various strengths and styles. ICU Eyewear in California was clearing out sample styles in their warehouse and offered to make them available for PfaP recipients. From this connection, two shipments of eyewear have already been successfully delivered to Mexico and Fuji by PfaP participants, and we will be taking the last shipment of approximately 380 pairs of readers to Zambia in June. In each case, the projects receiving this donation abroad were contacted to make sure this was an item they could use. Project Luangwa will be receiving half of the readers for Zambia. Another item for which the project expressed a need was warm clothing for children. This time, it was the east coast that came through for us. Last December PfaP was featured in the Costco Connection Magazine. As a result, a Costco member from Atlanta contacted me to see if we had a need for gently used fleeces and long-sleeved polo shirts that were available for donation from her children’s school. We gladly accepted the over 200 pieces of clothing that Carroll brought to Raleigh to meet this need during a visit to a family member. The last item we will be bringing for Project Luangwa will be sanitary napkins donated by Harris Teeter. They generously gave us $70 in store credits to select the exact products we could use according to the project’s needs list. This enables us to bring hundreds of sanitary napkins for girls who, without them, would have to miss school. Our second destination in Zambia is Lion Camp, which supports three different projects: Uyoba Primary School, South Luangwa, Conservation Society, and the Chipembele Wildlife Education Center. We have been able to collect supplies for each one. One project will be of particular personal interest to Noah. While visiting the Chipembele Wildlife Education Center, part of the Chipembele Wildlife Education Trust, we will be able to volunteer at their after-school music program. Noah, a percussionist and guitar player by training, is bringing his small ukulele for a jam session with the local children, which will be a new instrument for the children to experience. I also asked Anna Tolan, one of the Trust Founders, what we could bring that would be helpful for the budding musicians. Anna provided a wish list, and Noah’s family and Nina Patel of Vacations that Matter, a valued PfaP partner, are making it possible for us to bring 22 harmonicas, 22 recorders and four tambourines. In addition, Steve, the owner of Falls River Music in Raleigh made the financial donation go even further by selling us all of the instruments at cost, paying for the shipping and contributing ten sets of guitar strings and two tuners! Noah came over after school one day, and we carefully packed up the instruments to minimize the weight and space they would occupy in the luggage. Another generous donation came from the Sylvan Learning Center and the Huntington Learning Center, two local tutoring services that we contacted at The Raleigh Chamber of Commerce Small Business Expo, who each donated hundreds of pencils and rulers for us to bring to the Uyoba Primary School, supported by Lion Camp. Several friends also provided monetary donations to be specifically used to purchase school supplies such as chalk, erasers, pens, pencils, protractors, solar calculators and soccer balls. A company which wishes to remain anonymous donated 1,000 pens and 25 solar calculators. They also donated over 20 water bottles. These items were on the needs’ list for the South Luangwa Conservation Society, another project supported by Lion Camp. The last six days of our journey in Zambia will be spent between two sister camps, Chiawa and Old Mondoro, which both support Conservation Lower Zambezi, a project that focuses on environmental protection assistance, conservation education visits and supporting local community development in the Lower Zambezi. We will be visiting this project during our visit to Chiawa, where we will have the opportunity to donate the other half of the readers and an assortment of learning supplies in person. In addition, our local Costco generously gave us $150 worth of gift cards to use for some of the medical items requested by Conservation Lower Zambezi. This will enable us to bring a generous supply of multivitamins, ibuprofen and antibiotic cream. Two other requested items for this project were toothbrushes and toothpaste. During our visit to the Raleigh Chamber of Commerce Small Business Expo, we passed the booth of Riccobene Associates Family Dentistry. They were passing out gift bags with a toothbrush, toothpaste and floss. 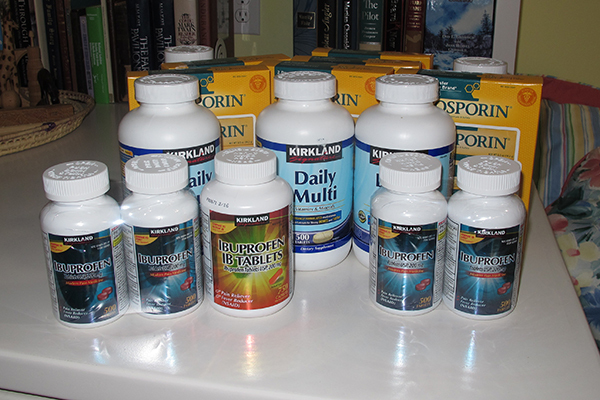 We thanked them, said we would take these to Zambia with us and explained what PfaP is. 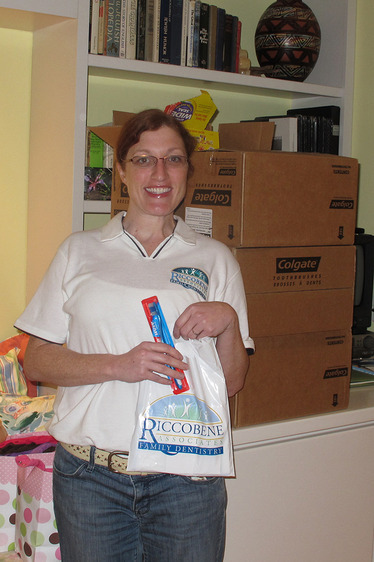 Their Office Manager asked if we could use additional toothbrushes as they had over 600 in their storage room in boxes marked For Donation. That same evening, they delivered the toothbrushes to our home. 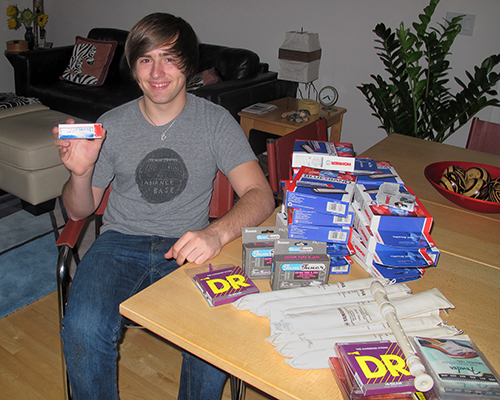 Our own dentist, Dr. Holesh, also graciously donated a case of toothpaste. 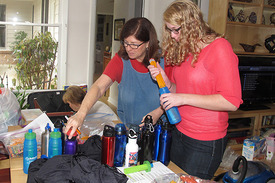 Then, after all of the collecting and connecting, we began the packing of the supplies. Once again, a community of caring individuals came together to support this initiative. 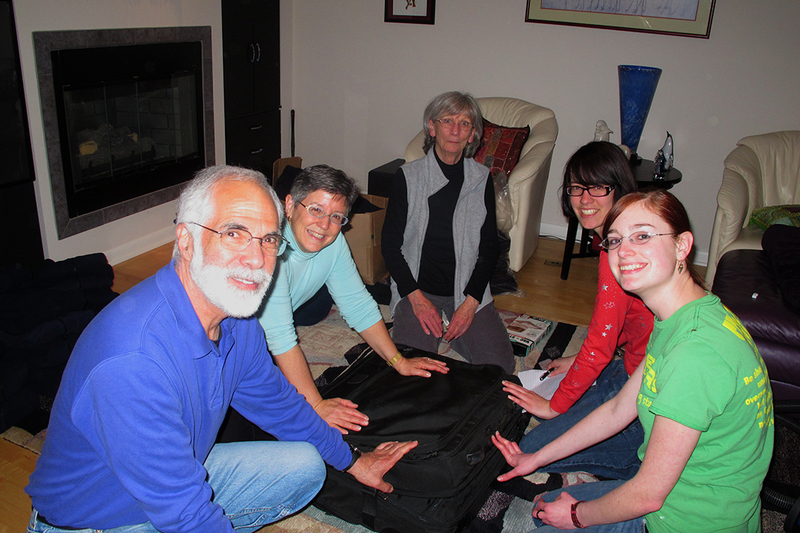 Board Members, volunteers and friends came to our home on two different occasions for packing parties and pizza. I would like to take a moment here to express my thanks to Laurie, David, Myranda, Cindy, Jan, Emily, Lindsey, Alicia and Noah for being efficient, cheerful and all around fabulous packers! All the luggage in which the supplies are now packed were once again generously donated by our long time partner Sharon Luggage. This caring community of individuals across America, by contributing specifically requested items and monetary donations earmarked for supplies to be delivered on our trip, have made it possible for my husband, Noah and me to bring over 500 pounds of needed supplies to Zambia. While every individual act of gratitude is rewarding, being a participant in such a caring community increases the joy tenfold. The time and resources used to collect, pack and bring over 500 pounds of supplies is great, but packing for a purpose reminds me how fortunate I am to be able to share the benefits of my life with the community that will host me. The knowledge that I am bringing supplies, that will provide educational opportunities for children and enhance the entire community, enriches my life as well. Any item from a requested needs list, brought by a PfaP traveler, is of benefit to that community. Every traveler that chooses to pack for a purpose is able to express their gratitude for the hospitality of that community in a meaningful way. Being taught by my mother that when you are part of a community, even as a guest, you are obligated to help that community, has framed my view of travel. 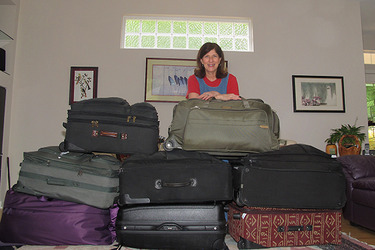 I am grateful to know, with certainty, that packing for a purpose is something that everybody can do, from backpacker to high-end traveler, from five-year-old to eighty-five-year old, from honeymooner to business traveler. No special skill is needed. When you PfaP, the trip that you take goes much farther than the miles you travel.